Flexibility must not come at high prices – the new Entry Level storage racking offers you high functionality at an attractive price. Join the world of Pandae Mobile. Let these Entry Level units inspire you to add to them over the lifetime of the product with extra racks and additional accessories. The racks are light in weight and can be fitted in all types of bakkies and panel vans. They can be fitted on the near- or off-side of the vehicle. You do not have to re-invent the wheel, in order to find the ideal solution of in-vehicle equipment for the variety of problems faced by the mobile professional. At Pandae we have developed an application specific range of modular in-vehicle equipment. The range is all mounted on safety tested and heavy load bearing floors. 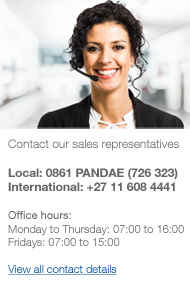 We have just launched a new division Pandae Green Solution. Click here to learn more.